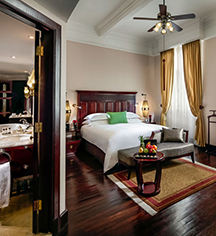 From French Quarter stylings, to Neo-Classical architecture, each guestroom at Sofitel Legend Metropole Hanoi presents an exquisite accommodation choice for its revered travelers. With guestrooms located in two historic wings, travelers can experience the sensibilities of the past, coupled with modern ambiances. With the option of one queen bed or two single beds, travelers can delight in the Premium guestroom, located within the hotel's tranquil Opera Wing. Sized at 344 sq ft, each boasts an elegant bathroom, with settings showcasing a bright color palette and wood floors. Guests can request a patio room for added luxury. A stay in one of the hotel's Grand Premium Rooms within the Opera Wing affords travelers with exclusive Club Metropole benefits, with luxuries such as butler service, breakfast, afternoon tea, cocktails, late check-out, and more. Each room is 517 sq ft, offering spacious interiors and modern furnishings. Guests can choose between one queen bed or two single beds. Each Luxury Room, with one queen bed or two single beds, is located within the Historical Wing, boasting natural wood flooring and an endless list of amenities. Emblematic of 1920s French design, the room's aesthetics are traditional, emphasizing the delicate history of the region. 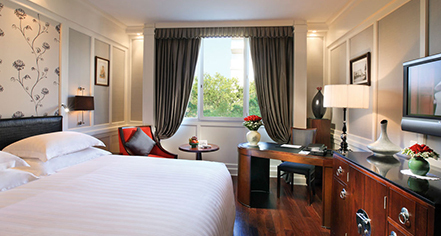 Each room offers a spacious 344 sq ft, affording an comfortable setting during a stay in Hanoi. The Grand Luxury Room offers 398 sq ft of space, comprising one queen or two single beds. Classic French architecture adorns each room, with an array of amenities featured as well.